When his BYU basketball team was struggling in December and January and suffering lopsided losses at the hands of No. 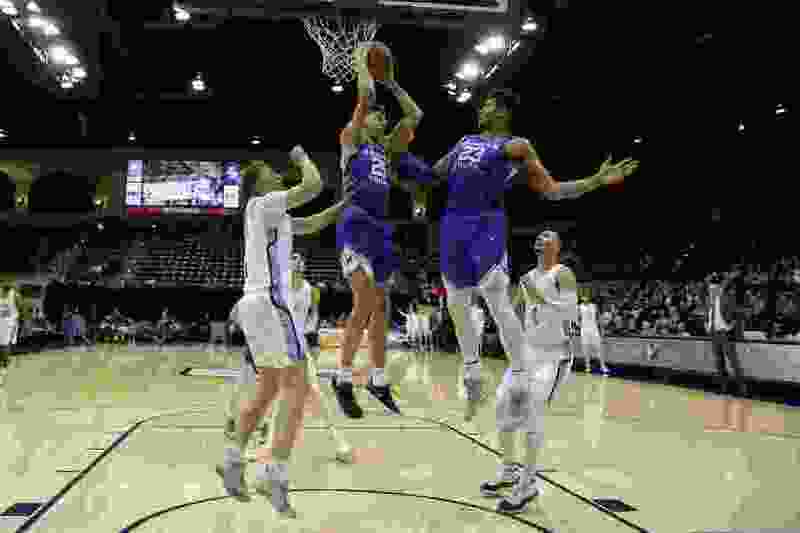 3 Gonzaga and at places such as Mississippi State, San Diego State, Saint Mary’s and San Francisco, coach Dave Rose often lamented that the Cougars lost interest defensively when things weren’t going well for them offensively. Unable to stop opponents from scoring, the Cougars have been on the wrong end of six losses by 14 points or more this season. That’s why Thursday’s 88-82 overtime win over San Diego at Jenny Craig Pavilion was so satisfying for the Cougars. They fell behind by as many as 14 points in both halves, but rather than crumbling like they have previously, they found a way to get back in the game, then won by outscoring the Toreros 13-7 in overtime. And defense was the catalyst at crunch time, as USD made just one field goal in the final three minutes of regulation and no field goals in overtime. “I am proud of them, because it looked like maybe San Diego was going to put us away two or three times, and our guys just had a tremendous resolve to continue to guard,” Rose told the BYU sports radio network after the game. The Cougars came up with a season-high 12 steals and forced USD to commit 18 turnovers, which BYU turned into 18 points. It was BYU’s biggest comeback win since it trailed Utah Valley by seven points in November. So the Cougars (9-3, 17-10) have won four straight games since that humiliating 93-63 home loss to Gonzaga, and appear to have turned the corner on their season. They are a game and a half in front of Saint Mary’s (7-4, 16-10) and San Francisco (7-4, 19-6) in the race for second place in the WCC, but another dangerous opponent awaits. BYU plays at Loyola Marymount (5-7, 17-9) on Saturday at 2 p.m. MST. The Lions have their best team since BYU joined the WCC in 2011-12, and gave league-leading Gonzaga all it wanted Thursday night before falling 73-60 to the Zags at Gertsen Pavilion. LMU led 54-53 with less than eight minutes remaining before GU put it away with a 13-2 run in the final five minutes to get its 15th straight win. The Cougars took a short charter flight from San Diego to Los Angeles immediately after the game in order to get all the rest they could. LMU upset BYU 76-69 last February at Gertsen, but the Cougars got some revenge two weeks ago with a 67-49 rout in Provo when LMU’s leading scorer, James Batemon, did not register a single point. Surely the senior guard with a 16.7 average will be raring to go on his home court, Rose surmised. LMU is 10-3 at home in their cozy 4,156-seat arena that is rarely filled unless Gonzaga or BYU is in town, mostly because the Zags and Cougars bring as many fans, if not more, than the home team. And staying engaged defensively, even when the shots aren’t falling on the other end. About the Lions • They have lost three of their last four games, including the 18-point setback to BYU two weeks ago in Provo and a 73-60 loss to No. 3 Gonzaga on Thursday night at home in which they had a lead with less than eight minutes remaining. … Senior G James Batemon leads them in scoring with a 16.7 average, despite being held scoreless in Provo in the first matchup with BYU. … Markus Mattiason, a 7-foot-3 center from Sweden, averages 10. 6 points and 6.7 rebounds per game. About the Cougars • They have a 1.5-game lead over Saint Mary’s and San Francisco in the race for second place in the WCC after edging San Diego 88-82 in overtime Thursday night at Jenny Craig Pavilion. … McKay Cannon tied his career-high with three 3-pointers against the Toreros and also had three rebounds, four assists and three steals. … Yoeli Childs had 27 points, 12 rebounds, two blocks and two steals vs. USD, recording his 15th double-double of the season. TJ Haws chipped in a career-high 35 points on 11 of 18 shooting and moved into 23rd place on BYU’s career scoring list.